Gelatin is extracted from animal skin, tendon and tissues. JELLICE TAIWAN manufactures Type-A (Acidulation) gelatin from fresh porcine and fish skin. It is low in heavy metal and inpurity, high clarity, and very suitable for food industry. 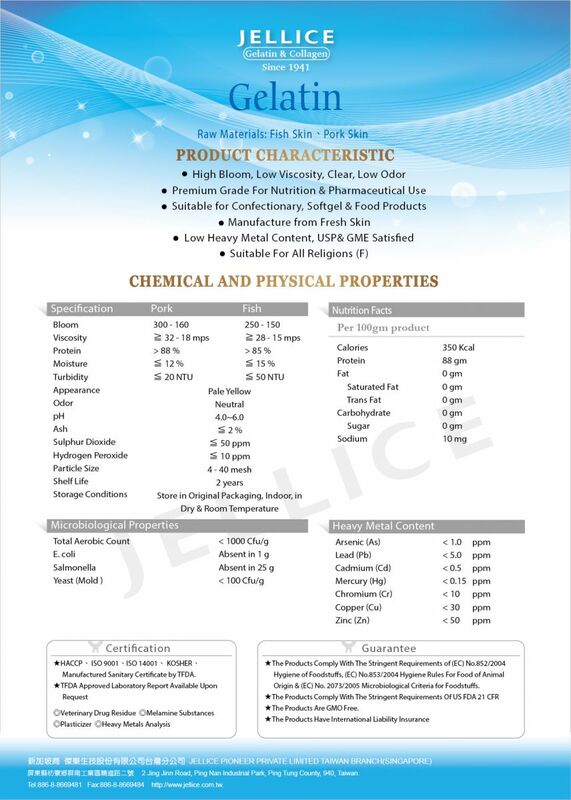 There are 2 methods of manufacturing gelatin; Type-A (Acidulation) & Type-B (Alkalization), JELLICE TAIWAN manufactures Type-A gelatin from fresh porcine and fish skin. Our technique was originated from Europe, and controlled by strict Japanese standards. JELLICE gelatin is low in heavy metal and inpurity, high clarity, high Bloom and low viscosity. The majority of our clients are in the candy/ soft capsule industry located in Japan and Europe. Due to religion practice, JELLICE fish gelatin is Halal & Kosher certifiable, and is suitable for all consumers. Our fish gelatin uses farmed/fresh fish skin of Tilapia and Pangasius; stable supply, free from disease and contaminant. In comparison, fish gelatin has lower melting point of porcine gelatin, therefore, it is easier to handle and may reduce energy/production cost. Dry gelatin absorbs water and swells, and starts to melt when temperature reaches ~35 ℃. Such gelling ability is thermal reversible; gels upon cooling, and melts again upon heating. Characteristics of gelatin include thickening, adhesion, emulsion and dispersion stability. Gelatin is often used in food industry for making of cookies, pies, cakes, sausages, ice creams and nougat.